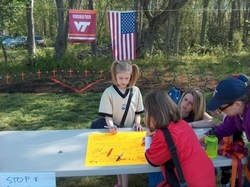 Picture of Upward Soccer players & parents signing cards to send to VA Tech students on April 21, 2007. VA Tech Memorial is located behind New Hanover Church at 10058 Chamberlayne Road in Mechanicsville, Virginia. For full set of photos and story.